A classic comedy of promises, courtship, hilarious mishaps, and true love. Tickets on sale now! 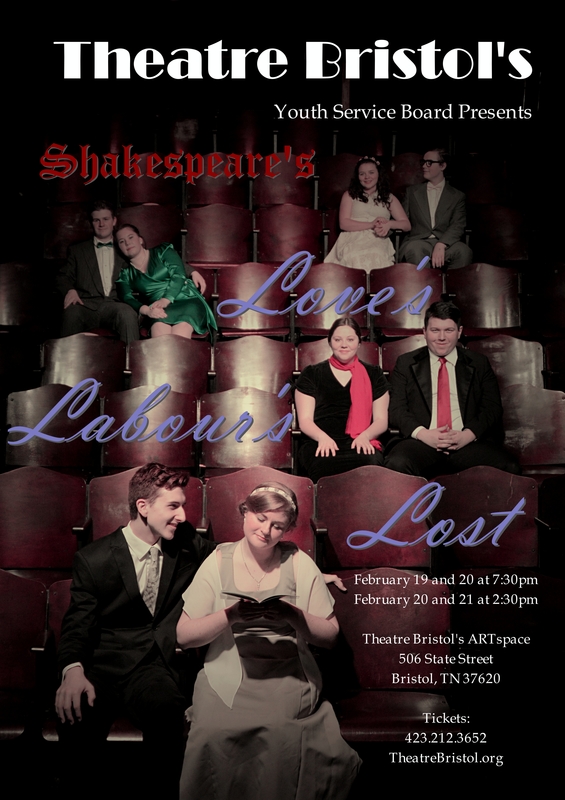 Bristol, Tennessee/Virginia, January 2016 — Theatre Bristol is proud to kick off its 51st season with a William Shakespeare romantic comedy, Love’s Labour’s Lost, opening the weekend after Valentine’s Day at the ARTspace Theatre, at 506 State Street, Bristol, TN. 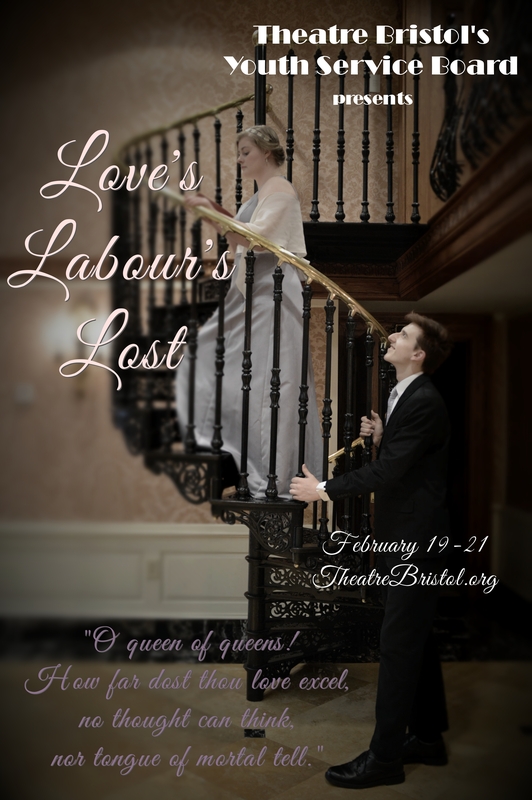 Love’s Labour’s Lost will run February 19 and 20 at 7:30 pm, and February 20 and 21 at 2:30 pm. It is produced by the Theatre Bristol Youth Service Board (YSB) and directed by Ben Fitton. Love’s Labour’s Lost opens with the King of Navarre (James Altman) and his three lords (Coy Owens, John Mullins, and Luke Gray), vowing to study while living a disciplined and single life for the next three years. Immediately after the pact is made, they remember that the Princess of France (Camille Gray) and her three ladies-in-waiting (Ashton Bishop, Anna Kimerer, and Emma Kennedy) are on their way to discuss business before the Princess’ father dies. The men are enchanted by their beauty and begin to search for a way around their vow. Hilarity ensues as the men make mistake after mistake, attempting to win the hearts of the ladies of France, while still trying to appear faithful to their vow and innocent to their fellow votaries. Woven into this already elaborate drama, an eccentric Spaniard (Daniel Freeman) and the Court Jester (Seth Gilstrap) are caught in a love triangle with a country maid (Rachel Locke), causing confusion to twist the plot even more. Rounding out the cast is a knowledgeable pastor (Dakota Otey), a witty page (Eden Phillips), and a skilled officer of the law (Addy Fitton). Love’s Labour’s Lost is clever and packed with fast-paced and comedic dialogue, as well as slapstick humor that will leave you rolling in the aisles. Love’s Labour’s Lost has been adapted, directed, and presented by its members. After the success of their last youth production, Pygmalion, the YSB decided take on the challenge of presenting Shakespeare. With the help of their mentors Samantha Gray and Steve Baskett, the YSB has put together a truly entertaining comedy about love and its many pitfalls. The YSB is a board of youth who work to further the mission of Theatre Bristol through their volunteer time, talents, and advocacy for the performing arts. The group commits to dedicating service hours at the Theatre by cleaning, organizing, promoting, and supporting the season productions while building their skills in the theatre arts. Founded in 1965, Theatre Bristol is the oldest continually running children’s theatre in northeast Tennessee and is now celebrating its 51st season. Its Main Stage season consists of up to five productions. Its performances take place in the ARTspace, a multi-purpose, black box theatre which seats up to 120 and the Paramount Center for the Arts. Theatre Bristol is entirely volunteer run and the community is invited to get involved. Love’s Labour’s Lost runs February 19-21, with evening performances on Friday and Saturday at 7:30 and matinees Saturday and Sunday at 2:30. Tickets are $8 for adults and $5 for students and seniors. Please call 423-212-3625 for reservations or try our new online services at TheatreBristol.org. PHOTOS AVAILABLE TO DOWNLOAD: High-resolution color photos of this production will be available for media use on the Theatre Bristol website. Additional photos available here.